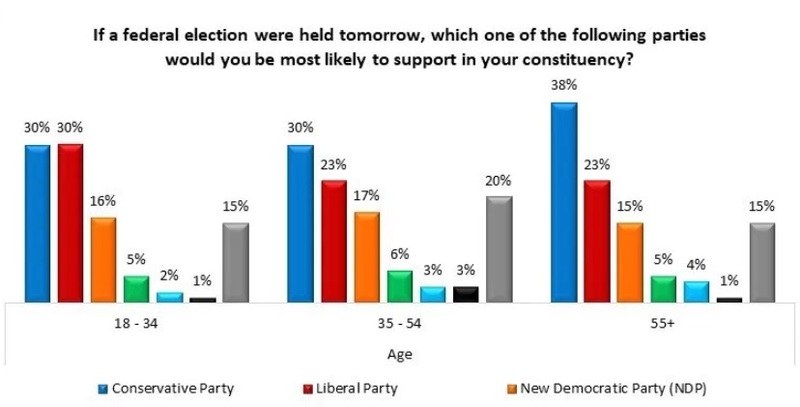 Millennials are the demographic most sought after and talked about by political parties these days, so the latest poll from the Angus Reid Insitute must have Liberal Party HQ worried. Not only does the poll show a ten point lead for the Conservatives nationally, 40% support for the CPC to 30% for the LPC, but there are some bad breakdowns when you look beyond the headline numbers. Regionally, the Liberals only have a significant lead in Newfoundland and Labrador. Demographics wise, the Liberals don’t lead in a single age group, not even millennials. 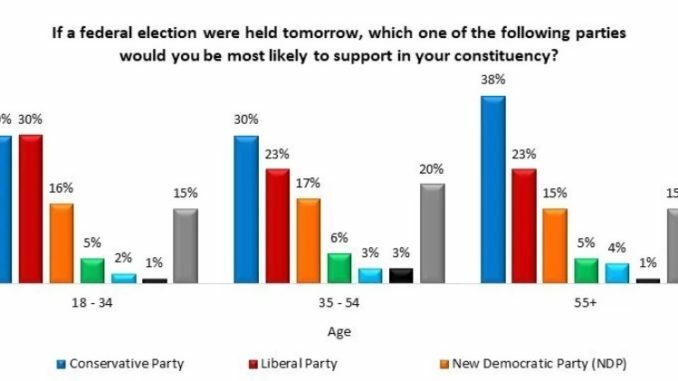 Consider that, in the last poll that Angus Reid Institute took before the last election the Liberals lead among those aged 18-34 by a margin of 43% for the LPC and in second was the NDP at 23%. The Conservatives were in third spot with just 22% support among those aged 18-34. That surge of young people voting combined with drops for the Conservatives in their lead among those 55+ really helped Justin Trudeau and the Liberals sweep to power. Two and a half years in and now young voters have looked and found Trudeau wanting. 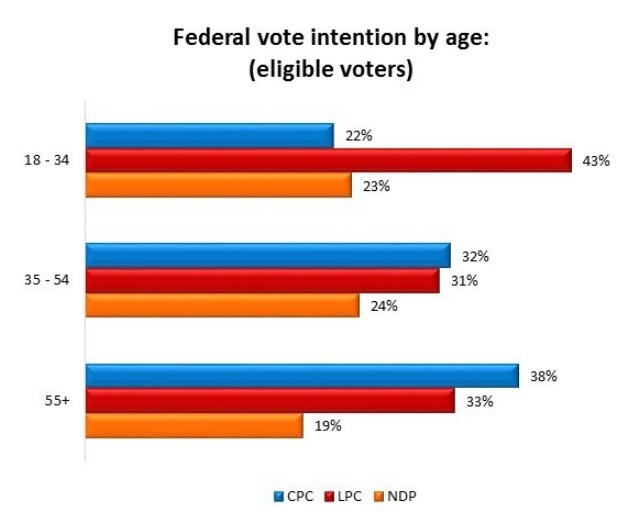 According to the latest poll of 5,423 Canadian voters aged 18 and over, a massive sample size, the Conservatives and Liberals are now tied among 18-34 year-olds. 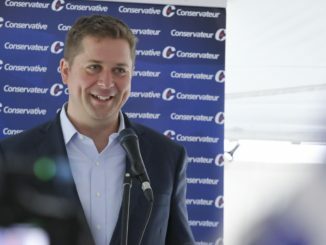 If an election were held today, 30% of voters 18-34 would back Andrew Scheer and the Conservatives while 30% would back Justin Trudeau and the Liberals. Jagmeet Singh and the NDP are well back in third at 16%. That is a stunning reversal of fortunes. Trudeau, who doubles as minister of youth, has spent almost as much time courting young voters as he has spent time courting women voters. To see his support level fall by 13 points among this key demographic is shocking. why do you find his fall shocking? The 55+ of voters find it refreshing. Even the young people that were all swept away by his promises see him for what he is now, just another yap, yap, yapping politico that did not keep his promises. It appears that Justin Trudeau, who “has spent time courting women voters”, has a negative public presence. The townhall meetings set quite an example, so … may his public appearances increase! 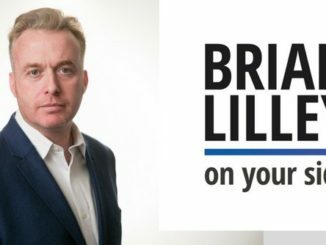 Brian, I always enjoyed your reporting. Miss you on The Rebel. The Current Federal Liberal Government is a 1 term gig. 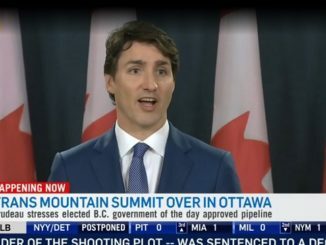 People are now seeing that their leader is Canada’s Biggest Moron and Idiot. Many years from now, the Liberal Party of Canada will look back wonder how they managed to put the bigeest Idiot in Canada in the #1 spot of the party and start crying. Now, when will some liberal back benchers grow a pair and do the same? Please,please.please let the numbers grow for conservatives. Thank God the millennial are smart enough to know they made a huge mistake which was not their fault. They were blatantly lied to 100%. It is so good to see that they are paying attention and know that Canada is depending on them being smart and getting rid of this PM for the sole purpose of shelling save Canada. thank God the millennials are paying attention. I know they voted Trudeau in however I do not blame them. He promised the world to them and blatantly has not followed up on anything. Canada is suffering and the suffering hasn’t even begun yet! We all must think of Canada first before it is destroyed. Trudeau does not care about us period and every time he opens his mouth it gets worse.Canada come together as a nation and get him out.